Released version 4.0.9 of the RSU Client. This version(with 4.0.0) includes a ton of changes! If wxperl is installed, the launcher will start if rsu-query is called without any parameters. 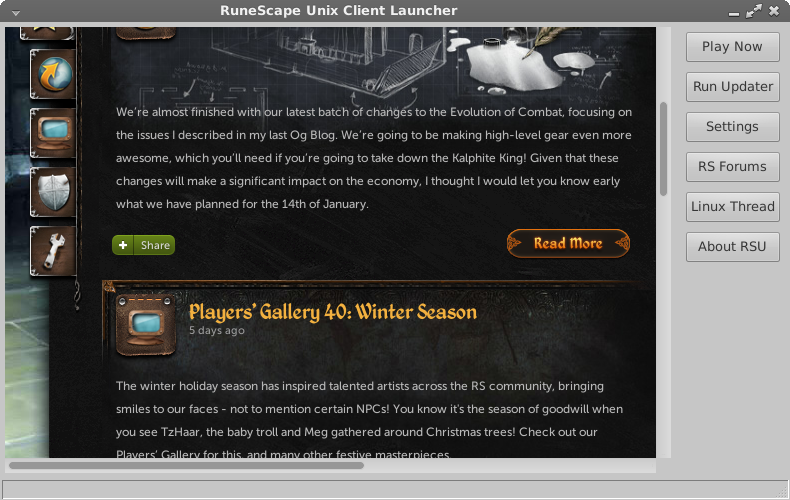 If wxperl is not installed, it will start runescape. Improved the look of the updater. Fixed memory leak in the client launcher. Let addons with info.conf at their root add themself to the updater! Running for the first time will now automatically download the jagexappletviewer.jar instead of asking you to update. Made launcher fetch news and do other time consuming operations in new threads. Yesterday i released version 3.9.7 of the RSU Client. This version contains some bugfixes and support for the new optional RSU Launcher. However only the github and PPA repository is updated atm. I will update the tar.gz archive within the next few days! Also the rsu-launcher uses wxwidgets2.9, so for now it will have to be packaged as an executable zip file to work on systems without wxwidgets2.9 and wxperl configured to use wxwidgets2.9 until it does this by default. Therefore you can find the rsu-launcher in my rsu-launcher repository on github. Just posting this to wish you all a happy new year. 1. Visit the US for the first time. Version 3.9.6 of the RSU-Client is now released and available in the LaunchPad PPA and from dropbox. 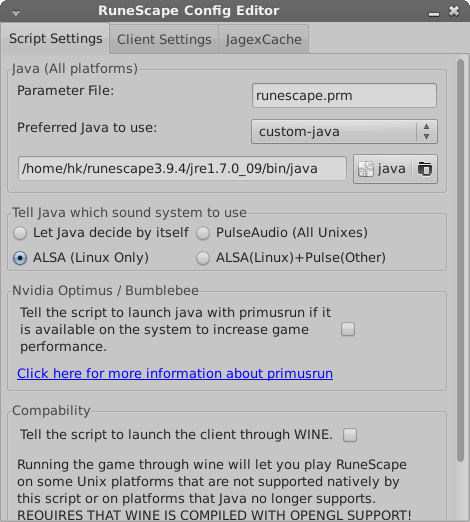 This new version contains Nvidia Optimus support through the use of bumblebee and primusrun. As a last note, the LaunchPad PPA packages are now automatically built from the git repository, this means that the packages are updated automatically and should be available within 1 day after a release. The beta of the RSU-Client is now available at GitHub! Please test it and give feedback about the addons functionality in the Community - Linux thread on the RuneScape Forums.